Sign up to receive our monthly newsletter via Email! 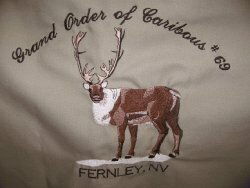 When it comes to embroidery services, no job is too big, or too small, for the embroidery team at A Stitch of Country. From uniforms, hats and shirts, to patches, coats, sports bags, and sweatshirts...you name it, we can embroider it! On-site design digitizing gives us the capability to turn your ideas into embroidery art. We can even order clothing items to meet your specific needs. Want to add a personalized touch to your one-of-a-kind project? We can create custom embroidered labels...and so much more. Contact us today for information on our prompt, affordable embroidery services!